Cook the leeks in a pan over a low heat with 50g butter for about 30 minutes until soft and creamy. Add to a separate bowl once cooked. Boil the mushrooms for 10 minutes, then fry them in the same way as the leeks until soft and golden. Remove from the pan and set to one side. To make the béchamel sauce, heat the JUST MILK in a pan until almost boiling, then reduce the temperature to a gentle simmer. Meanwhile, in a separate, heavy-based saucepan, melt the butter gently then slowly stir in the flour to form a paste. Cook over a moderate heat for about one minute , stirring continuously, then slowly add the hot JUST MILK through a sieve. Once all the JUST MILK has been mixed in, season to taste with salt, black pepper and a pinch of cumin. Simmer for a further 20 minutes over a low heat. Lay the first sheet of puff pasty over an oven proof dish and prick with a fork. 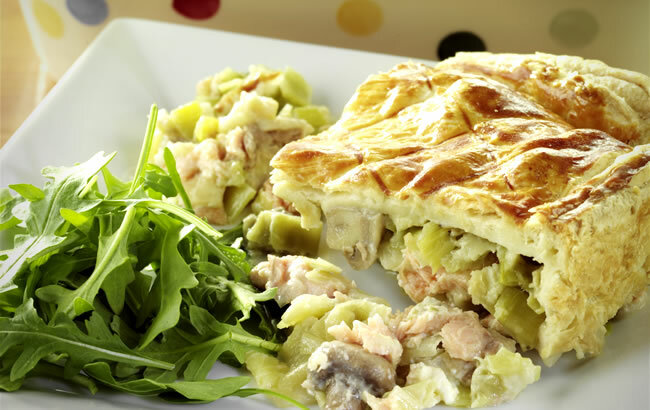 Place a layer of salmon, a layer of leeks, a layer of mushrooms and a layer of bechamel sauce onto the pastry, then repeat until you reach the top of the dish. Finish by adding the second sheet of pastry to the top. Brush the lid of your pie with an egg yolk. This will give it a lovely golden finish. Make a small hole in the lid of the pie to allow a little air to circulate while it’s cooking. This will help stiop the pastry going soggy! Serve hot with your choice of salad or vegetables.